Chilly days don’t stand a chance--this full-zip fleece hoodie is the perfect addition to your wardrobe for those crisp days when you need an extra layer. Protect your head and ears from the wind chill with the hood and drawstring that give you a snug fit and are paired with metal grommets for extra strength. Lower patch pockets are the perfect place for your cell phone, car keys or cold fingers. Coverstitching and the rib-knit cuffs and hem help keep the shape of your sweatshirt, wash after wash. Shaped side seams and a tapered waist offer a flattering, feminine fit. This printed pullover features True Edge Transfer, a unique imprinting process that allows for freestanding text without a border and accentuates fine lines and detailed images! 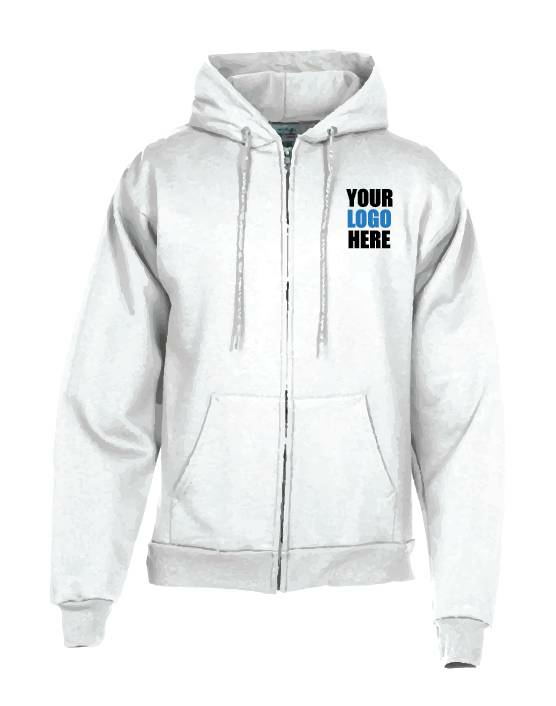 Your price includes a full-color imprint on the left chest and on the Back.